The newest Tech-friendly office tower could be a crucial differentiator in Class A Financial District office space, with delivery in 2020. 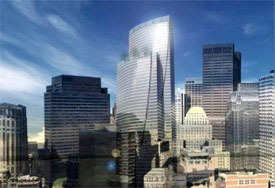 According to Bisnow, Trans National CEO Steve Belkin and EVP (development) Justin Krebs want to help Boston become a global financial/tech innovation cluster…proposing “a $900M tower downtown that would include an elaborate two-story 22,500 SF Entrepreneurial Innovation Center that’s free to the public. They hope that the space where financial services pros, tech talent and university folk join forces will help elevate Boston’s brand as a global hotbed of financial innovation. Steve, an entrepreneur who’s launched 30 companies of his own, is also answering Mayor Walsh’s call to help make Boston the world’s innovation leader by 2030. You can read the full article on the Bisnow website.